Those old enough or curious enough will know Jackie Gleason is synonymous with comedy and 50s television. But “The Great One” had a reach that also extended into arranging music, and his Christmas arrangements are truly classics of a bygone era. “Jingle Bells” becomes beautiful in Gleason’s hands, stripped of the frantic pace and chanting vocals. Christmas music shouldn’t be annoying. It’s pure bliss. Sting takes his music seriously, and Christmas music is no exception. With a serene, gentle, almost medieval Christmas feeling, Sting brings his unforgettable voice, and some truly beautiful arrangements provide a welcome reprieve from the clatter and clamor of the commercial Christmas season. It’s an inviting soundtrack for those crisp winter mornings or warm nights by the fire. It may seem like we’re all out of ideas, but the recommendation of Dickens’ A Christmas Carol is sincere. Every Christmas this story is told and retold in TV shows and movies...it’s so ingrained in our consciousness that we almost know it by heart. Return to the original, re-read the classic with fresh eyes and experience the timeless joy firsthand. It’ll remind you why we keep telling it. It really is THAT good. Gregory Maguire (Wicked) has never lacked for inspiration when penning his “updated” fairytales. This time Maguire turns to Hans Christen Andersen’s The Little Match Girl. Written to be read aloud and gorgeously illustrated, Matchless will surely rekindle your Christmas spirit. Brian DePalma’s The Untouchables deftly reimagines the takedown of notorious Chicago crime boss, Al Capone, played by a spot-on Robert DeNiro. Kevin Costner and Sean Connery, who nabbed an Academy Award for his performance, also star. A must-see modern-day classic for fans of mobster flicks. 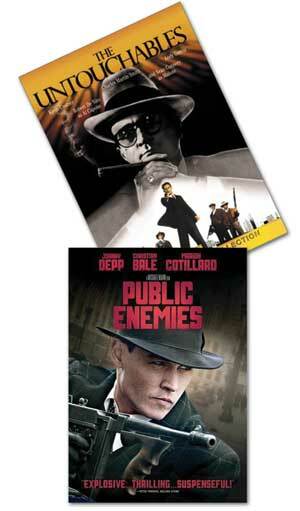 Johnny Depp gives a humanizing performance as John Dillinger in Michael Mann’s superb gangland-era drama, Public Enemies. With great character development, Mann lends cinematic realism to a crime wave lionized by popular history, and depicts a mad, incompetent scramble by the Feds to capture the criminals at its center.